The Fed chose to cut and the immediate response is a sell off in the long bond markets. With the GDP and ADP reports where they were my guess is this cut dealt a substantial blow to the FEDs inflation fighting credibility and that ironically those looking to refinance into 30 year mortgages my find it more difficult. A Cut on These Numbers???? My fellow bloggers have repeatedly said that the looming recession is "worse than expected." I am not sure what tea leaves they are reading. Perhaps, they mean that housing is collapsing faster than estimates? But, we knew that would happen didn't we? All forecasting models assume that the future will be like the past. Yet, no person seriously thought this future would be like any past that we've seen. Underperforming the models was to be expected. What wasn't expected was the increase in new jobs, surging GDP and consumers with their credit cards out in force. A cut on these numbers is downright irresponsible and could ironically make long term rates go up on justifiable inflation fears. No cut today. Perhaps, no cut in December. We need to see some slack first. Is the Core a Ruse? Barry Rithotlz says that the FED chooses to use the core so that it can ignore the fact that inflation has been anything but contained over the last decade. 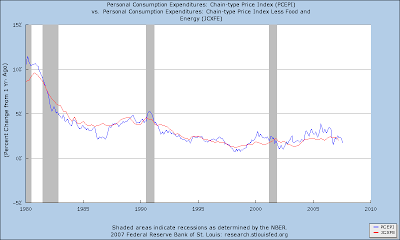 Food and Energy is where the real inflation is but the FED has blinders on. 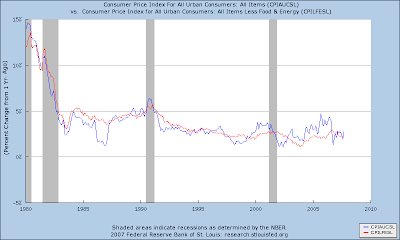 To look deeper at that theory I have both the CPI Core and Headline (top panel) and the PCE Deflator Core and Headline since 1980 when Paul Volker took the helm and the FED got serious about inflation. There are at least three things to note. 1) The core, especially in the PCE series, seems to behave like a core, in that is cuts through the ups a down of the headline rate. 2) There were periods in the 1980s when the core was consistently above headline inflation. 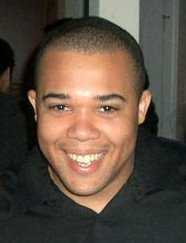 3) The real aberration occurs around about 2004-2005. Judging from the general behavior you would expect the headline to dive below the core again. But it doesn't, it jumps up and continues its see-saw pattern at a higher level. That coincides with both Katrina and the general realization that there was going to be no easy way out of Iraq. Both of those events tightened the market for energy and we have experienced a sustained increase in the price of energy that is not clearly supported by market fundamentals. This seems like precisely the kind of thing that the FED should not be jumping at. Not much time recently. I wanted, however, to make a note of my thoughts on FED policy ahead of next weeks meeting. As I mentioned before I have been consistently more hawkish than the Bernanke or Greenspan Feds. Last time I called for 50 bps, with another 25 in Oct based on where the data was trending. The data did not, however, unfold as negatively as I had guessed. My stance would be to hold on Oct. and wait for the data to cut again, possibly another 50 bps in December. Part of my reasoning is that we do not in fact have enough data to justify a cut, and partly because the thinking on Wall Street has evolved into believing there is a FED put. While balancing inflation expectations and unemployment should always be the FEDs predominant concern, efforts should be taken to relieve the moral hazard posed by presumptions that the FED is "pro-stock market." This provides the perfect opportunity to accomplish both goals. The Federal Open Market Committee decided today to keep its target for the federal funds rate at 4-3/4 percent. While trends in the consumer real estate remain negative and the outlook for overall growth is slightly below potential, financial markets have stabilized considerably since the summer. Recent readings on inflation have been promising and core inflation has moderated as expected. However, headline inflation readings remain elevated and there are concerns that secular trends in agricultural prices will begin to raise inflation expectations. While risks to both inflation and output remain, the committee's predominant concern is that an acceleration in the housing correction could contribute to protracted weakness in US growth rates. The committee will monitor data as it comes in and is prepared to act, rapidly if necessary, in response to significant deterioration in output and employment. One line of reasoning suggests that business cycles are really credit worthiness cycles. That in good times ever more shaky borrowers are allowed access to credit. At some point the credit bubble pops, lending standards rise dramatically and the economy slides into recession. 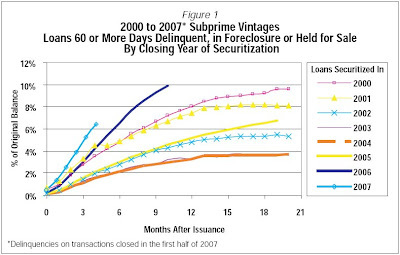 Looking at the above picture on subprime delinquencies are we seeing just that. A sharp decline in delquinacies in 2003 as the recovery took hold and then a big increase in 2006 -2007 as the economy begins to slide back towards recession. Of course the other explanation is that economic conditions are driving the delinquencies but then how do you explain that they seem to lead the job market? For example, jobs were still soft in 2003 when delinquencies were low and the market is just now softening though delinquencies have risen. Arnold Kling and Tyler Cowen pooh-pooh the work that won the latest Nobel Prize in Economics. I tend to stand more in line with Alex Tabarrok who credits mechanism design with inducing a greater appreciation of markets. More broadly I would say that Incentive Compatibility Constraints (ICC) are the theoretical nail in the coffin for socialism. When I talk with serious socialists, and yes they do exists, ICC is always the backbone of my arguement. Yes, the market does badly I say - but the question is whether it is even theoretically possible to do better. The sophisticated socialists tends to believe that current incarnations are a bogus and that are more through, scientifically designed socialism would be more successful. Incentive compatibility constraints show why that it is unlikely. They also help us out of conspiracy theory traps and frightening pop fiction. The problem I always say with 1984 is that it completely ignores any semblance of incentive compatibility. In what sense is the politics of 1984 consistent with a law enforcement structure that pursues its own personal interests? Who enforces the law upon the enforcers? And the who enforces the law upon them and why don't they all just collude? Lastly, however, ICC gives a window of insight into dictatorship and helps us think through why claims that Iraqi people must uniformly welcome the US as liberators. If they all hated Saddam then by what means was Saddam maintaining power. All successful power structures must be incentive compatible. There must be some reason why it is not in the best interests of the generals to lead a coup. That reason is going to be key in establishing a successful government. I am late to a debate going on between Bryan Caplan and Greg Clark over the Malthusian Regime. Bryan essentially takes the stance that decreases in population should not be seen as key in raising the standard of living. Presumably because of increasing returns to scale in the production of technology. However, it seems straight forward to me that that increasing returns in one factor of production are temporarily outweighed by decreasing returns in another. Overtime as technology accumulates the overall functional form moves from decreasing to increasing returns. That shift represents the transition from the malthusian regime to the modern epoch. Below is a simple numerical example of this type of thing. Income is a constant returns to scale function in technology(we are thinking of ever more advanced capital), labor, and land. Technology does not depreciate and its accumulation rate is increasing in the total population level. The population grows a steady 2%. Land is fixed. At first income per capita is decreasing because land is fixed. However, eventually enough technology accumulates that its increasing returns production dominates the fixed quantity of land. One has to remember, however, that population effects the growth rate of technology, not its level and that the underlying capital accumulation is driven by income, perhaps even income per capita if you consider minimum consumption constraints. Therefore, it is possible that far from delaying the industrial revolution the black death brought on the industrial revolution by increasing per capita income at a high level of technology. Basically what helps in this model is to build up a big population to increase the technology level and then to wipe a bunch of them out to increase income per capita. The historically unusual combination of technology and wealth will rocket you forward. On the one hand July was revised up 25K, August up 93K and Sept came in at 110K for a total of 228K more jobs than we would have thought the day before. On the other hand the March 2007 Benchmark revision slashed 257K jobs - leaving the overall level of jobs 17K less than we would have thought. On net it is roughly a wash. However, I would suggest that the sizable downward benchmark revision is not the best sign. The BLS methodology produces considerable inertia in the estimates. The birth death model creates or destroys jobs based on how well the monthly data performed in relation the benchmark last time around. The upshot is that the NFP report will tend to miss turning points. Indeed, if the turning points are close together in time the the methodology should significatly amplify the peaks and troughs. If the benchmark March 2007 was already revising jobs downward then that implies to me that the turning point was likely sometime before that. Thus all of our estimates until the new benchmarking comes into effect will be overshoots. March 2007 and that our overshoots are actually accelerating. It will be interesting to see how the unemployment rate fairs by the beginning of 2008. Both September NFP and the August revision were well off my predictions. The overall benchmark adjustments were in line. That is, job growth was significantly weaker this year than reported. As a result the BLS data is now roughly in line with ADP. My confidence in a Oct rate cut has dropped significantly. More later. My non-model guess is 50K new jobs created. See Calculated Risk on a good chart showing BLS vs ADP estimates of private employment. The ADP report shows less volitionality and there is reason to believe that BLS has overshot the peak. To date BLS is reporting 200K more private jobs than ADP. I expect that the BLS report will be playing catch up in the coming months.